SUMMARY: Continues the story of Rose and Noah, whose love is forbidden because Noah is Amish. Rose moves in with an Amish family, ready to do anything to keep Noah by her side. But Amish life is harder than Rose anticipated, and Rose's family wholeheartedly disapproves. REVIEW: This is one of those books readers will either love or hate. I loved it, just as I loved its predecessor, Temptation. For me, it's easy to get swept up in Rose and Noah's story. Author Karen Ann Hopkins writes a fast-paced story that I could not put down. While Rose still seems spoiled and Noah is a bit rigid in his ways, I cared about both of them and still can't see how they could possibly be together considering their completely opposite worlds. The end has a cool twist; it will be interesting to see how that plays out in Book #3. I loved how Belonging introduces some new characters and expands the stories of some of the peripheral characters. We see a softer side of Rose's brother Sam, who was pretty unsympathetic in Temptation. He's still a jerk at times, but with some of the chapters from his viewpoint, readers get to see his side of the story. Belonging does not rehash many of the events from Temptation, so if it's been awhile since you read it (or you have not read Temptation at all), you might want to brush up a bit. An incident at a party in Temptation is mentioned several times, but I could not remember what exactly happened at that party. I did not remember exactly what had happened to Noah's horse Rumor in Temptation, and the story gives few details about it. There will be people who do not like Belonging at all, but they probably didn't like Temptation, either. As with Temptation, Belonging is melodramatic, with lots of tears and misunderstandings and secrets. Rose and Noah are so wrapped up into each other that they are willing to sacrifice everything to be together, and some will say it's too much for people who are so young. Both Rose and Noah have their faults, and I'm certain that some reviewers will tire of their games. 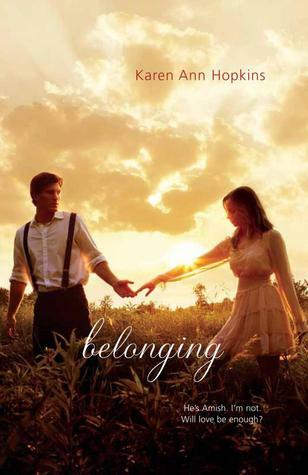 If you like your romances to be level-headed, sensible, and without drama, then Belonging probably isn't for you. But if you love forbidden romances with characters hell-bent on staying together despite insurmountable odds, I highly recommend you give Temptation and Belonging a try. THE BOTTOM LINE: If you loved Temptation, you'll love Belonging. STATUS IN MY LIBRARY: It's not out yet. I just got Temptation for my high school shelf, which just got checked out for the first time last week. I will get Belonging if a student requests it or if Temptation ends up being very popular.